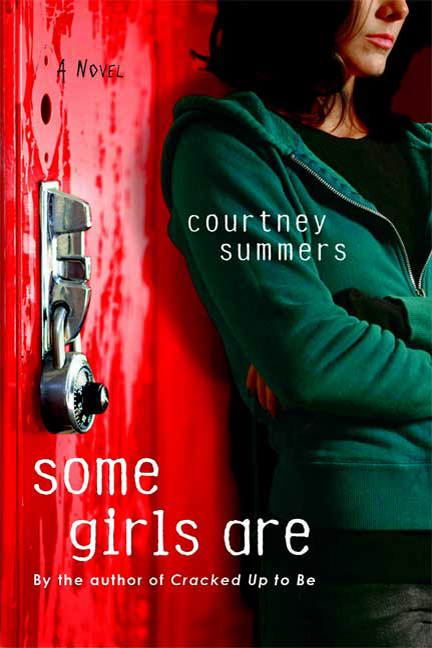 Some Girls Are by Courtney Summers. St. Martin’s Griffin, 2010. Currently available. Face Value: Half girl alert! She’s missing part of her body and head! I wish that that publishers could just be ok with girls’ faces being on book covers and then we could all move on with our lives. The painted locker connects with the story, but it makes this look like a murder mystery rather than high school fiction. From a distance, I thought that the locker was dripping with blood rather than paint. Creepy. Does it break the slate? Not even close. This is a story about girls doing terrible things to one another. They cut each other down. They ruin lives. They never advocate for one another or support the choices that other girls make. This is a cautionary tale of how not to be a Slatebreaker. Who would we give it to? Some Girls Are is not a book that makes you feel good about yourself. It is difficult for me to pinpoint how I would recommend this book. Perhaps if I saw a bullying issue among the youth with whom I work, I would encourage some of them to read this book and think about the consequences of targeted harassment. I don’t know if that would work, though. When you are the instigator, it’s not so easy to recognize the impact of your actions. Review: Sometimes terrible things are fictionalized in a way that desensitizes us to the true seriousness of the issue. Mean Girls is an example. The bullying and harassment in that movie are truly awful, but it’s done in such a comically exaggerated way that we laugh at it. The bad girls get payback, there’s a peaceful resolution, and we all go home happy. But that’s not usually how it plays out when things get nasty and friends turn on one another. Regina Afton was one of the “it” girls. She rules the halls of her high school as the second-in-command to the queen bee, Anna. Regina has enjoyed the privileges of her rank in the school culture…until it all comes crashing down around her. Regina and Anna have a falling out after Anna’s boyfriend sexually assaults Regina at a party. Too fearful to go to the police, Regina instead tells Kara, another girl in their clique. Kara takes this information and spins it into vicious rumors about Regina. Regina is then “frozen out” of their clique. If only a “freeze out” was as cold and passive as it sounds. Yes, the girls completely reject Regina and refuse to interact with her directly. But there is also a vicious, aggressive approach to Regina’s eviction from the group. They paint the word “whore” across her locker. They trash her belongings. They sabotage her personal life. Anywhere Regina turns for solace, they ruin it for her. Regina’s exile is made more painful by her own guilt over having been part of the same cruel acts back when she was part of the “in” group. No one in the school is willing to reach out to her because she’s been so evil to them before. Regina’s dismal situation shows the reverberating impact of bullying. When you’re on top, you’re safe – but that safety is never guaranteed, because you don’t know when you might become the target. Regina is a challenging character because she used to be one of the bullies. It makes it more difficult to empathize with her, even when she’s at her most miserable. Because she used to be one of the agressors, Regina relies on those old techniques to get back at the bullies. She jumps ahead into vengeful actions without considering more peaceful ways of settling dispute. Regina fought back against her bullies by doing things that were just as disgusting to bring them down. I appreciated that she wasn’t going to sit there and take it, but I wanted to see her do something less underhanded to get back at these girls. Regina repeatedly acknowledged how “sick” they all were for doing such terrible things. The overall impact of the book is nauseating. It made me feel ill to listen to the descriptions of everything they did. I listened to this as an audiobook, and the performance was strangely compelling. I hated how Regina and the other girls treated people, yet I wanted to hear more because the performance was well done. The author’s style of storytelling is engaging, despite the dark tone. Some Girls Are is a roadmap of everything girls need to change about the way we treat one another. If readers choose to pick up this book, I hope they come away with a renewed sense of commitment to changing the way social structures operate in high schools. This entry was posted in Reviews, Young Adult and tagged Bullying, cliques, high school, revenge. Bookmark the permalink.